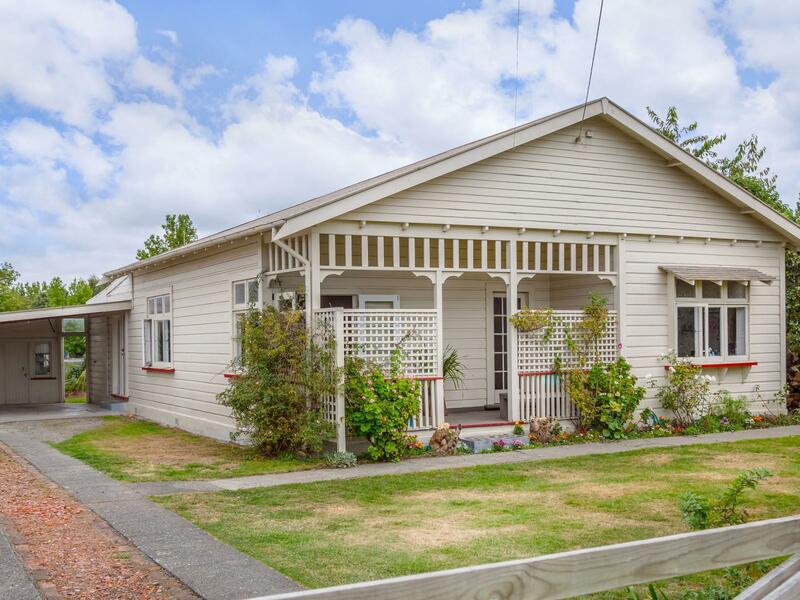 Come in and be prepared to fall in love with this very charming 1920s character home. An eye catching front verandah showcasing features that typify New Zealand bungalow architecture draws you to the entrance. Once inside you will immediately be struck by the warmth of natural timber doors and trim, and a feeling of spaciousness afforded by the high stud and generous entrance lobby. Enjoy comfortable family living and socializing with friends in the open-plan kitchen dining and large lounge which takes the indoors outside through tall french doors onto a recently built deck, and into a private rear garden with bricked patio perfect for barbecues. There are three big bedrooms all with built-in wardrobes, and the french doors opening from the master to the front verandah add a romantic touch. Lovers of character will admire the timber lined bathroom, the use of exposed brickwork and polished timber floors while appreciating the convenience of a large laundry, a second entrance foyer, second toilet and lounge logfire. The property is fully fenced and has a double carport with workshop and office at the rear. And although it is located close to town and all local amenities, you will be blissfully unaware of this as you enjoy a semi-rural outlook hidden to the eye from the street. This is a much loved family home and is one you will want to cherish. Please call me, Greg Ariell, now to view. To auctioned on site at 1.00pm on Wednesday 24 April unless sold prior.